Hello, folks! The purpose of this exercise is to delve deep into a character's mind and tease out interesting eccentricities about them, the bits and pieces of unique information that make them special. Each question is designed to help think about the character more and understand them. Whether you're responding to one question or all of them, hopefully your character speaks to you all through it! 1. People don't behave the same way all the time. In fact, they generally have a mask for every social group -- friends, family, business. Sometimes they have a different mask for different groups of friends. How does your character act around different people? How does their personality shift and change? 2. Your character has been brought to a party and promptly ditched. They don't have a ride back home. How does this work? How comfortable are they around all of these strangers? Do they interact? I see a lot of "OC questionnaires" and stuff that are really silly and goofy... and that's great, but I'd really love a serious one to help with character development. I also wanted on that asks the actual character the questions, so they can respond. So here is my attempt to create a useful questionnaire to fill out using your characters. I made this with the intention of using one character, but feel free to choose several characters and rotate them between questions. The most important part of this is to be thorough. I tried my best to stay away from "yes/no" questions, but elaborate. If your character is one that doesn't speak much, feel free to include their unspoken thoughts as well. Also, I tried to stay vague so that you can fill this question out with your 16 year old high school student OC, but also with your 23 year old Ninja Warrior from feudal Japan. And probably your random closed species giraffe/shark hybrid too. Here Is a Really long, Very in-Depth questionnaire to really get to know your troll OC. You should come into this with an idea of what your character is like, or else you will get stuck. You can use this as much as you want, just if you post it anywhere, link back to me! And if you want, put a link in the comments. I would love to see your guys fantrolls. Some of the questions are very general, while others are Alternia- specific. I wrote them as if "you" are the character, but you can answer them in third person if you want. Feel free to skip questions, because, trust me, there's alot of em. But try to answer them all! Now, Enough from me, let's get started! What is your Trolltag and typing quirk? How’s your vocabulary? Any particular phrase you like to use? 1. Answer as your character. 2. The interview can be answered by any type of character (original, fan-made e.t.c). 3. Feel free to answer the optional questions below within the interview. 1. Who is your partner? Tell us a bit about them. 2. How did you meet, and how did you get together? 3. What is your partner's best physical feature? 4. Name one hobby or passion of theirs. 5. Name one thing you like about their personality. 6. Name one thing you dislike about their personality. 7. What is something you absolutely love about them? 8. What is something you absolutely cannot stand about them? 9. Is your partner the romantic type? Do you want them to be? 10. What makes them special to you personally? 11. How much do you think your partner loves you? 12. Do you want to be with them for the rest of your life? Do you think you will be? Thank for taking this interview, __________. This is an incredibly thorough questionnaire for your major characters. There's a reason I call it a "Dissection." 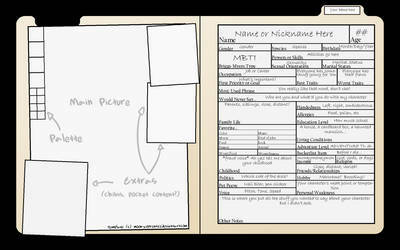 I've already posted the minor character sheet for all those people you don't need to know the favorite foods and alcohol tolerances of. These are all geared toward protagonists, but can be applied to villains too. How to effectively develop a realistic and likable character for novels and fanfiction. It can be assumed that developing a plot and storyline is self explanatory. If not, you can find another tutorial for that. This tutorial will focus primarily on the thought-process of creating new characters with depth. I. A name is the first step. Try to match the character to their name, or somehow integrate the character's name into the storyline or progression of the character's maturity and personality. For example, a character who is dark and moody would probably not be named Star unless this contradiction holds some meaning in the story. (In a comedy it would have a nice effect, but in a drama or serious story, not so much). Who is your character in a nutshell? How would you summarize them in one sentence or paragraph? What kind of occupation do they have in their day-to-day existence? What actions must they perform within the story? What is your character’s backstory? What kind of background do they come from? How has their past shaped your character’s beliefs, attitudes, and decisions? What goals do they want to achieve, and which psychological forces motivate them to pursue these goals? Why should we care about this character? If your character is heroic, what qualities make them sympathetic enough to win our support? If your character is villainous, why should we root for their ultimate downfall? What strengths does this character have? What skills or talents do they possess that help them achieve their goals? What weaknesses make this character vulnerable? Please read my comments before continuing. So, I know there are a lot of character memes and interviews out there, and while I think they're a great start, some of you may want to go into much greater depth with your characters. In my opinion, that's an absolutely fantastic idea. With that in mind, let me just say that this is going to be a MASSIVE questionnaire; some of the questions will be very basic just to warm you up, and some of them may be completely irrelevant to your character. Don't try to answer a question if it just doesn't seem right  you don't want to force your character, still underdeveloped or already developed, into a situation, reaction, or anything else you know would not happen, or at least don't think would happen. It was only the first day of summer and already I was bored out of my skull. I was browsing DeviantArt, seeing if any of my friends were doing anything, when I noticed somebody had sent me a note. 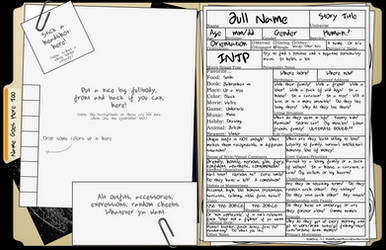 I opened it and saw it linked to some kind of TG questionnaire they had found, asking what I’d be like if I were a girl. Seeing as I had nothing better to do, I decided to give it a try. I printed it out, grabbed my trusty pencil, and looked over the questions. Question 1: If you were a girl... would your handwriting be nice? Well, my handwriting is already pretty nice, so yes. As I wrote down my answer, my writing seemed to become straighter and less crooked. My hands also felt a bit smaller and more petite. Question 2: If you were a girl... would you like pink? I guess. It wouldn’t be my favorite color or anything, but I would wear it and maybe have some pink decorations in my room. > Please introduce yourself, in your own words. What are your interests? My name is Cyril Berthault-Jacquier. I'm French, and I have lived in Brussels for the last ten years. I have frequented deviantART for more than ten years, but I have had multiple accounts in that time. I'm passionate about art in general; in photography, painting, and so on. I'm also a compulsive reader, with a particular taste for contemporary Japanese literature. That's why I chose "KizukiTamura" as a pseudonym here: Kizuki Tamura is a character from a book by Haruki Murakami. "Ah, these new gigais feel great~!" "Don't get too used to it. We're only here for the mission. Remember that." "Fine...whatever you say, Captain Buzzkill." Hi, and thank-you for the invitation! I set up my presence on deviantART under a screen-name that is German, and it means BlueBerryCake in English. It's pronounced more-or-ess like "blauw-bear-koo-khen", and was maybe not exactly the smartest idea, but now I am BBK here and that's fine.